I’ve been spending way too much of my time lately writing about the best musical moments of this soon-to-be-finished decade. So I figured, why not get a little negative? I dipped into my archives for a look back at the worst live performances I had the pleasure to get paid to see over the last several years, and one instantly rose to the top – Avril Lavigne at HSBC Arena on March 29, 2008. It was a display of everything empty and devious about mass-marketed art, pairing an anesthetized punk aesthetic with plugs for the artist’s clothing line at Kohl’s. The review’s below, enjoy! It’s almost unfair to ask anyone older than a teenager for an objective opinion of Avril Lavigne. Because while her utterly manufactured sound, emotions and image are about as grating as anything in popular music these days, it’s also a masterfully crafted cocktail for adolescent music fans. On Saturday night in HSBC Arena, Lavigne’s core demographic hung on her every word, screaming and dancing along to songs about girlfriends and skater boys like they were on some kind of sonic sugar high. The moment the singer hit the stage, it was clear why the youngsters were acting like they’d had too much of their Halloween stash. Everything about Lavigne’s “Best Damn Tour” was purely confectionary, from the pink and black motif to the backup dancers and the mindlessly hooky pop songs. The strokes of genius amongst all the tween-friendliness were the fake symbols of rebellion, such as the skull and crossbones spanning a large portion of the stage floor. By making the kids feel like they were at a rock show without offending their parents, Lavigne’s set designer pulled off quite a neat trick. Unfortunately, the singer herself doesn’t have such a wide appeal. Starting her set with the massive hit “Girlfriend,” the Napanee, Ont., native strutted around the stage accompanied by her fauxhawk-laden dancers, half-singing and half-screaming the chorus to the obvious delight of the crowd. Sure, the refrain is idiotic on paper (“Hey hey/you you/I don’t like your girlfriend”), but as Lavigne delivered it live, her shrill, reedy voice gave it a level of obnoxiousness that can only be experienced in concert. The singer’s five-piece band ripped right into the next tune, “I Can Do Better,” but not before she could say, “Are you guys ready to rock out? 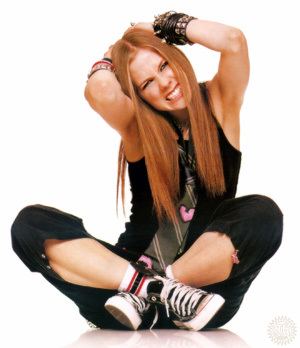 This song is about being strong, not settling, not taking crap!” Another upbeat, 99 percent pop and one percent punk rock tune about believing in yourself, “I Can Do Better” is one of two weapons in Lavigne’s repertoire, the “angry punk song” and the drippy ballad. The rest of the night played out as expected — a few rockers, a few ballads, repeat. But even though the arena crowd was noticeably sparse, it made a serious racket the whole time. Seeing the way young people take to her music, it casts a different light on some of her lyrics. Whether intentional or not, a few lines can be legitimately read as explorations of how frustrating it is to grow up and enter the real world. As Lavigne sang lines like “Why’d you have to go and make things so complicated?” and “This innocence is brilliant/I hope that it will stay,” it was almost as if she understood, and cared about, her audience. But Avril Lavigne is more of a brand than an artist. The angst that’s present in her songs is less “life isn’t fair” and more “life isn’t fair because my mom wouldn’t buy me those capris at American Eagle.” Life does get complicated when you get older, but it comes with a silver lining. With real emotion comes the inspiration to make great art — something Lavigne hasn’t quite gotten the hang of.